We’d love your help. 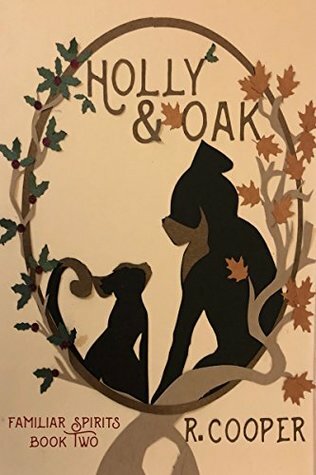 Let us know what’s wrong with this preview of Holly and Oak by R. Cooper. Once a year, the town of Ravenscroft celebrates the winter solstice by watching the Oak King symbolically slay the Holly King to ensure the death of winter. To most people, it’s a pagan ritual that has lost all meaning in the modern world, harmless fun during the week of Christmas. To the coven who founded the town, it’s a magic so important they entrusted it to the two st Once a year, the town of Ravenscroft celebrates the winter solstice by watching the Oak King symbolically slay the Holly King to ensure the death of winter. To most people, it’s a pagan ritual that has lost all meaning in the modern world, harmless fun during the week of Christmas. To the coven who founded the town, it’s a magic so important they entrusted it to the two strongest witches in generations. To ask other readers questions about Holly and Oak, please sign up. I liked this one better than the first one by a long way. I commented in my review of the first book that this author uses miscommunication and not talking to each other as a common tool. It didn’t work for me in the first book, but this is one of the cases where that tool works, because there was a reason behind it. Not just one of the characters believing that the other wouldn’t want them and not trying, but actual events that lead up to where they are now. I connected easily with Chester as we were in his head and had a glimpse of where he was coming from, Will was a harder character to connect with, I liked him as a character but he was harder to get to know due to all of the half communications. That was the problem I had with this one and I did mark it down because of all of the half conversations where they didn’t really say what they wanted to made it harder to follow along and work out what was going on. You definitely need to have a grasp of the Holly and Oak legend to appreciate the story fully, so read the blurb carefully, it gives good background that the story itself doesn't give until you're well in to the story. I loved Chester and felt so bad for the raw deal he'd been dealt by the town. Getting to know he and Will as the story progresses is a treat and the two had so much more depth than the town gave them credit for. They truly embodied the characters in the legend and the author did a You definitely need to have a grasp of the Holly and Oak legend to appreciate the story fully, so read the blurb carefully, it gives good background that the story itself doesn't give until you're well in to the story. This was lovely. I really enjoyed it. Not my favourite R. Cooper, but a goodie nonetheless. Oh, I loved this. Chester and Will and their combative, yet sweet relationship were so good. I really liked the premise of Oak and Holly, and how they shared the power and what it meant for each of them to give it up. I'm docking half a star because I felt, like in the first book, that too much was told rather than shown. I didn't really understand why Chester was kept away from Will, or why he was so hated by literally everyone. 3.5/5. I really like how the author creates atmosphere in both this and the first book in the series, but I find these books slightly hard to follow. The lack of plot clarity, along with a few editorial errors, keep me from enjoying the beautiful, seasonal atmosphere and rich details as much as I'd like to. Cute, short story. Although, some of it was very hard for me to follow. Things just weren't clicking and I felt I didn't know what was actually happening. I'm chalking it up to me being exhausted while reading the story. This was beautiful and heartbreaking, a story of two boys kept apart by a childhood misunderstanding and a town's contempt but kept together by that same town's need. Now adults, choices have changed and they face a whole new world that will change them and the town. William and Chester are two very powerful witches. They are the most powerful in many generations, so their town decidedto to use them to enact an old ritual of power to bring prosperity to the town, one of the Holly and Oak king. Oak, summer, is taken by William, a nd beloved by the small farming town. Meanwhile Holly, winter, is taken by Chester, and the already outspoken young boy is shunned by the town. With this separation the town also seeks to protect William from Chester, even though all Chester wants is a friend who understands the power and responsibility. William grows up beloved while Chester grows up ignored. This review has been hidden because it contains spoilers. To view it, click here. FEELS!!!!! Oh my gawd, this story was just so BEAUTIFUL. I was misty eyed the entire time. The balance of Will and Chester and the contrast is so elegant and delicate~ I just love ever FEELS!!!!! I really enjoy these Familiar Spirits books! I have reread the first one many times. The author just has a way of making your heart squeeze with the characters feelings. It’s a perfect mix of anxiety and cheer. What if summer and winter are just ordinary guys or maybe not that ordinary because they are witches and not really summer and winter but figures in a solstice ritual where the holly king and the oak king take the power and magic of the other depending on the solstice. As the most powerful witches of the small town of Ravenscroft Chester and William are more or less forced into those roles for the benefit of the town and the surrounding area and act to their roles. Friendly and sunny Will liked by everyone and cranky, stubborn Ches kept apart by the coven members while Chester is hopelessly in love with Will. I really liked this premise and the story, plus both main characters had layers and depth. The thing about R. Cooper stories is you are sort of dropped in the middle (or at least the middle of the beginning or maybe even end of the beginning) and you don't know what is going on. It takes me about 1/3 of the book to figure out the story. Once I figure out the story and the characters and who is who and what is what, I think it is a solid book. But until then, I am always grasping at the ideas of who and or what is important. It is confusing. Holly and Oak is no different. It seems like The thing about R. Cooper stories is you are sort of dropped in the middle (or at least the middle of the beginning or maybe even end of the beginning) and you don't know what is going on. It takes me about 1/3 of the book to figure out the story. Once I figure out the story and the characters and who is who and what is what, I think it is a solid book. But until then, I am always grasping at the ideas of who and or what is important. It is confusing. Ches has been in love with Will for years, they are the strongest witches in their town coven and are used to herald in both summer and winter. So cleverly written! A creative force of magick and today's headlines. Very inside the head of the co-protagonists and how fear of the unknown can paralyze. I've read this twice and enjoyed it even more the second time. I highly recommend this great short story into the dimension right next to ours. I enjoyed A Little Familiar and I really enjoyed Holly and Oak. The story is engaging and Chester and Will adorable. I also loved the familiars. This book as the first will become a part of my holiday reading. This review has been hidden because it contains spoilers. To view it, click here. The Familiar Spirits covers are what drew me to the books. The story is good, interesting take on the seasons and what powers them! However, the big missing pie piece is the spice, these books need those missing bed scenes. I liked the concept of Holly and Oak. Chester and Will's relationship was sweet, and I really liked Chester's friendship with Mercy. Overall I enjoyed the book, but I did find the last "chapter" dragged a bit. A short epilogue with flowers would have worked better for me. I just love this series so intensely. A quick and easy read, this story had more characters and interactions than the preceding story, which made it a much more rounded and satisfying read. Encore une situation qui part d'un problème de communication mais sans devenir énervant. Feel free to friend me on Twitter, Facebook, or Tumblr. Or just visit my websit I'm a somewhat absentminded, often distracted, writer of queer romance. I'm probably most known for the Being(s) in Love series and the occasional story about witches or firefighters in love. Also known as, "Ah, yes, the one with the dragons."